Bored SysAdmin’s Blog Gets Google Page rank 2 !! Whooo !! Please everyone raise your Champaign glasses and let me toast you guys – its was your interest and active participation. Too all people who copy&paste stuff from my blog without referencing back to me – thanks, but no thanks. Please be at least courteous to reference back to source. In right corner of the page there is Donate button and you all welcome to use it to help support the cite and allow to spend more time to improve and add new content. Even as much as $5 would be a welcome addition. As donation volume will improve I’ll consider removing advertisements from site entirely. Thanks again to everyone and I hope I’ll still have time to blog this year. Posted by BoredSysAdmin at 11:24 AM . Posted by BoredSysAdmin at 10:44 AM . Continuing series of my experiences with new Windows 7 I’d like to share solution for one more annoyance artificially created by our dear beloved Microsoft. What is it Network Level Authentication ? 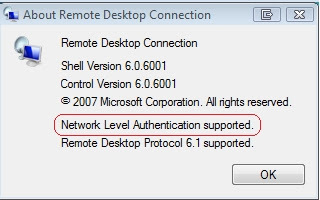 It’s a new and more secure way to establish RDP connection to remote host and which require less resources prior to completion of authentication process, thus making host more resilient to DDS attacks. Additional layers of encryption [TLS 1.0/FIPS 140-1&2] plus single-sign on is also a nice add-on. Rumors have been around about Windows XP Service Pack 3 will enable ability to use NLA to connect to Vista/Windows 7/Windows 2008 Server hosts , but alas the miracle didn’t happened (almost). Why almost? Because Microsoft did include required files to support NLA or more precisely it’s core component - the new Credential Security Support Provider (CredSSP) protocol, but “forgot” to enable it by default. Luckily they left back door open to enable CredSSP on XP SP3, but it’s a bit tricky as it involves tweaking Windows Registry. Here’s another fine example how Microsoft hates early software adapters – in order to upgrade to final retail version of newest operating system Windows 7 from it’s beta - MS suggests to downgrade to Windows Vista before upgrade ?! BOOOOOOOOOOO!!! Luckily for us they also give us geeks (aka IT experts) there is a way around operating system check during installation and here is the steps according to Microsoft, one will have to perform in order to bypass the OS verification. These same steps will be required as we transition from the RC milestone to the RTM milestone. Again, we know many people (including tens of thousands at Microsoft) are relying on the pre-release builds of Windows 7 for mission critical and daily work, making this step less than convenient. We’re working hard to provide the highest quality release we can and so we’d like to make sure for this final phase of testing we’re supporting the most real world scenarios possible, which incremental build to build upgrades are not. At the same time everyone on the beta has been so great we wanted to make sure we at least offered an opportunity to make your own expert and informed choice about how to handle the upgrade. We’re always humbled by the excitement around the releases and by the support and enthusiasm from those that choose to run our pre-releases. We’re incredibly appreciative of the time and effort you put into doing so. In return we hope we are providing you with a great release to work with at each stage of the evolution of the product. Our next stop is the RC…see you there! I ‘m going to try the procedure myself once the Windows 7 Release Candidate is out to see how it works. I followed my own advice and updated my and my boss’s work pcs from Beta 7000 to RC 7100 without ANY issues. So workaround works. Confirmed. Which is basically same thing, but fully compatible to Windows 7. Remember after finishing download & install, go to Control Panel/ Programs and features / “Turn Windows Features on or off” and Enable the tools you want from “Remote Server Administration Tools selection. P.S: Microsoft provided versions for both 32 and 64 bit systems. P.S.S: I tried to install Adminpak.msi for Vista and fiddle with settings/permissions – Nothing really works – Don’t waste your time. Original link was pointing to RSAT for beta, since then the tools updated for RC version.